In the eyes of a new vaper, the term “sub ohm vaping” could draw a bit of confusion, could be seen as gibberish, or some futuristic term only used by the most elite vapers in the world. Although sub ohm vaping used to be a term only in the advanced vapers vocabulary, it’s not used more loosely by the majority of vapers around the world. The reason for this is because the market has transformed into something different from what it was in the earlier days, and the act of sub ohm vaping started becoming more common, which was all due to the fact that these manufacturers began designing their products based on -what most simply know it as- sub ohming. But, what is sub ohm vaping, is it still this elite term used by only the advanced, or has it turned into the standard? 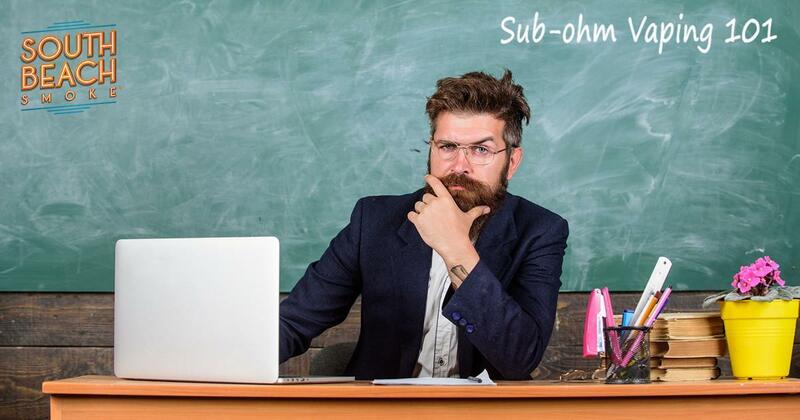 Find out in the what is sub ohm vaping blog entry where we explain what sub ohm vaping is, how it works, along with the advantages and disadvantages that follow along with it. Simply put, sub ohm vaping is when you use a coil with a resistance below 1.0 ohm. When your atomizer coil produces a resistance below 1.0 ohm, you’re in what’s called sub ohm, meaning below an ohm. Instead of moving forward or above in resistance, you’ve went backwards or below in resistance. Any time your atomizer has a resistance below this 1.0 ohm, then you’re technically sub ohm vaping. When trying to understand what sub ohm vaping means, it’s simple as placing the two terms together. The term “Sub” means below, while “Ohm” is an electrical measure in resistance used to define the ohm of a coil. When Sub is placed in front of Ohm, this indicates the coil is below the standard or below a positive resistance. A coil with a positive resistance begins at 1.0 ohm, and to be classified as a sub ohm coil, the coil would need to be below 1.0 ohm. With that said, any coil that is below 1.0 ohm is considered sub ohm vaping. What’s made sub ohm vaping so popular over the years has been due to its ability to allow users to increase the wattage output, meaning more power is applied to a coil with a substantial lower resistance. The coils that offer these lower resistances are typically complex and have a lengthy ramp up time, so more power can be applied to them, along with giving the user the ability to take longer draws. If you put two-and-two together, you can easily determine the outcome — a higher power output and longer draws will equal more vapor. How Did Sub Ohm Vaping Start? When sub ohm vaping first started, vapers would be forced to use mechanical mods only, as these types of devices presented no limitations. Being that the mechanical mod didn’t rely on a chip or no internal circuitry, there were no safety features equipped for the user, which posed a red flag. At this time, sub ohm vaping wasn’t popular or trendy, and surely wasn’t the norm. The reason for this is because manufacturers care for the safety of the people using its products, so sub ohm coils were very scarce, if even heard of by many. As the market began to evolve and the hunt for larger clouds became something of interest to consumers, manufacturers then started creating regulated mods that were not only equipped with safety features, but also gave the ability to use lower resistance coils. As you would expect, over time those minimum resistance offerings got lower and lower. In today’s era, sub ohm vaping is easily achieved, as there are a plethora of tanks and mods designed specifically for sub ohm vaping. It’s as easy as ordering a sub ohm tank and combining it with a regulated vape mod that accepts atomizer resistances below 1.0 ohm. There are many advantages to sub ohm vaping, which are the very reasons why sub ohming became such a big hit in the world of vaporizers. The question is though, what exact advantages are there to sub ohm vaping. We’ve prepared a small list for you to look at and compare the advantages to the disadvantages. While there are several advantages that make sub ohm vaping tempting, there are just as many disadvantages to sub ohm vaping. It’s up to you if the advantages outweigh the disadvantages. Either way, we’ve taken the time to prepare a small list for you to look at and compare the disadvantages to the advantages. Depending on where you are in your journey, sub ohm vaping may not be for you. However, anyone can try it, and if you feel you’d like to try it, we’re here for you! We’ve recently revamped our product offering to provide sub ohm vaping and traditional vaping/electronic cigarettes. Check out our Vaporizers and Accessories page to see all of our new items! What strength e-cig is right for you?